Chegamos ao Meio Dia. O horário do almoço. O momento onde fazemos aquela deliciosa refeição. 🙂 Aliás… você sabe como dizer MEIO DIA em inglês? É fácil! 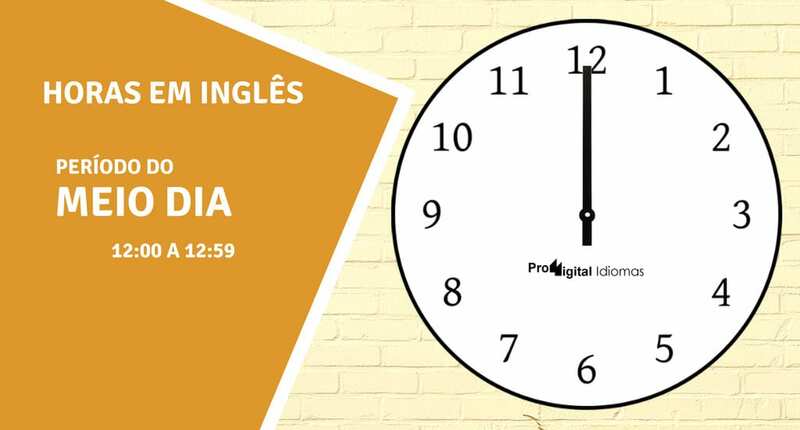 Você pode dizer Twelve, Twelve o’clock ou as expressões mais comuns se ouvir dos nativos do idioma inglês que é o Noon, Midday ou High noon. É ou não é fácil? Mas enfim… além das 12 horas em inglês (meio dia), também vamos aprender todas as horas em inglês por extenso das 12:00 às 12:59. Então continue abaixo e vamos para a nossa lição. Mas antes, baixe a ferramenta Anki aí no seu computador/celular e memorize cada uma dessas formas de se dizer os horários em inglês. Você ainda não conhece essa ferramenta? Então acesse aqui e veja esse tutorial completo sobre o Anki. Acabamos de aprender acima que MEIO DIA em inglês possui cinco opções simples de dizer, e que os mais usados são Midday, Noon e High noon. Fácil fácil para memorizar, não é? Aposto que você já gravou e não vai esquecer mais. 🙂 E já falando em esquecer… não se esqueça que o uso do “o’clock” é usado somente para horas em inglês em ponto. Vamos começar nossa lição aprendendo a escrever os horários das 12:00 às 12:15. Twelve one Twelve one p.m.
Fifty-nine minutes to one Fifty-nine minutes to one p.m.
Twelve two Twelve two p.m.
Fifty-eight minutes to one Fifty-eight minutes to one p.m.
Twelve three Twelve three p.m.
Fifty-seven minutes to one Fifty-seven minutes to one p.m.
Twelve four Twelve four p.m.
Fifty-six minutes to one Fifty-six minutes to one p.m.
Twelve five Twelve five p.m.
Fifty-five minutes to one Fifty-five minutes to one p.m.
Twelve six Twelve six p.m.
Fifty-four minutes to one Fifty-four minutes to one p.m.
Twelve seven Twelve seven p.m.
Fifty-three minutes to one Fifty-three minutes to one p.m.
Twelve eight Twelve eight p.m.
Fifty-two minutes to one Fifty-two minutes to one p.m.
Twelve nine Twelve nine p.m.
Fifty-one minutes to one Fifty-one minutes to one p.m.
Twelve ten Twelve ten p.m.
Fifty minutes to one Fifty minutes to one p.m.
Twelve eleven Twelve eleven p.m.
Forty-nine minutes to one Forty-nine minutes to one p.m.
Twelve twelve Twelve twelve p.m.
Forty-eight minutes to one Forty-eight minutes to one p.m.
Twelve thirteen Twelve thirteen p.m.
Forty-seven minutes to one Forty-seven minutes to one p.m.
Twelve fourteen Twelve fourteen p.m.
Forty-six minutes to one Forty-six minutes to one p.m.
Para o Meio Dia e Quinze em inglês, podemos usar várias opções conforme veremos abaixo. Mas é bastante comum pelos nativos da língua inglesa, o uso do termo “a quarter past” para designar que já se foram 15 minutos após o Meio Dia em inglês (ex. 15 minutos passado do Meio Dia). Vamos ver abaixo como fica o uso desse termo para esse horário da Meio Dia e Quinze em inglês, além de outras formas. E depois vamos aprender como escrever as horas em inglês das 12:15 às 12:29. Twelve fifteen Twelve fifteen p.m.
Forty-five minutes to one Forty-five minutes to one p.m.
A quarter past noon A quarter past twelve p.m.
Twelve sixteen Twelve sixteen p.m.
Forty-four minutes to one Forty-four minutes to one p.m.
Twelve seventeen Twelve seventeen p.m.
Forty-three minutes to one Forty-three minutes to one p.m.
Twelve eighteen Twelve eighteen p.m.
Forty-two minutes to one Forty-two minutes to one p.m.
Twelve nineteen Twelve nineteen p.m.
Forty-one minutes to one Forty-one minutes to one p.m.
Twelve twenty Twelve twenty p.m.
Forty minutes to one Forty minutes to one p.m.
Twelve twenty-one Twelve twenty-one p.m.
Thirty-nine minutes to one Thirty-nine minutes to one p.m.
Twelve twenty-two Twelve twenty-two p.m.
Thirty-eight minutes to one Thirty-eight minutes to one p.m.
Twelve twenty-three Twelve twenty-three p.m.
Thirty-seven minutes to one Thirty-seven minutes to one p.m.
Twelve twenty-four Twelve twenty-four p.m.
Thirty-six minutes to one Thirty-six minutes to one p.m.
Twelve twenty-five Twelve twenty-five p.m.
Thirty-five minutes to one Thirty-five minutes to one p.m.
Twelve twenty-six Twelve twenty-six p.m.
Thirty-four minutes to one Thirty-four minutes to one p.m.
Twelve twenty-seven Twelve twenty-seven p.m.
Thirty-three minutes to one Thirty-three minutes to one p.m.
Twelve twenty-eight Twelve twenty-eight p.m.
Thirty-two minutes to one Thirty-two minutes to one p.m.
Twelve twenty-nine Twelve twenty-nine p.m.
Thirty-one minutes to one Thirty-one minutes to one p.m.
Para o Meio Dia e Trinta em inglês, também possui um termo que é bastante comum de se ouvir no dia a dia pelos nativos. É o termo “half past” (meia hora depois / e meia). Vamos ver abaixo como é usado esse termo para os trinta minutos após o meio dia em inglês. E também vamos ver como escrever as horas em inglês das 12:30 às 12:44. Twelve thirty Twelve thirty p.m.
Thirty minutes to one Thirty minutes to one p.m.
Half past noon Half past twelve p.m.
Twelve thirty-one Twelve thirty-one p.m.
Twenty-nine minutes to one Twenty-nine minutes to one p.m.
Twelve thirty-two Twelve thirty-two p.m.
Twenty-eight minutes to one Twenty-eight minutes to one p.m.
Twelve thirty-three Twelve thirty-three p.m.
Twenty-seven minutes to one Twenty-seven minutes to one p.m.
Twelve thirty-four Twelve thirty-four p.m.
Twenty-six minutes to one Twenty-six minutes to one p.m.
Twelve thirty-five Twelve thirty-five p.m.
Twenty-five minutes to one Twenty-five minutes to one p.m.
Twelve thirty-six Twelve thirty-six p.m.
Twenty-four minutes to one Twenty-four minutes to one p.m.
Twelve thirty-seven Twelve thirty-seven p.m.
Twenty-three minutes to one Twenty-three minutes to one p.m.
Twelve thirty-eight Twelve thirty-eight p.m.
Twenty-two minutes to one Twenty-two minutes to one p.m.
Twelve thirty-nine Twelve thirty-nine p.m.
Twenty-one minutes to one Twenty-one minutes to one p.m.
Twelve forty Twelve forty p.m.
Twenty minutes to one Twenty minutes to one p.m.
Twelve forty-one Twelve forty-one p.m.
Nineteen minutes to one Nineteen minutes to one p.m.
Twelve forty-two Twelve forty-two p.m.
Eighteen minutes to one Eighteen minutes to one p.m.
Twelve forty-three Twelve forty-three p.m.
Seventeen minutes to one Seventeen minutes to one p.m.
Twelve forty-four Twelve forty-four p.m.
Sixteen minutes to one Sixteen minutes to one p.m.
Para os 45 minutos após o Meio Dia, podemos usar dois formatos, Meio Dia e Quarenta e Cinco ou Quinze para o Meio Dia. E para esse segundo, é comum o uso do termo “a quarter to” (quinze para) para dizer que faltam um quarto da hora cheia (15 minutos) para chegar ao próximo horário. Vamos ver na tabela abaixo como podemos usar esse termo “a quarter to” para dizer Quinze para o Meio Dia em inglês. E depois vamos concluir nossa lição aprendendo como escrever as horas em inglês das 12:45 às 12:59. Twelve forty-five Twelve forty-five p.m.
Fifteen minutes to one Fifteen minutes to one p.m.
A quarter to one A quarter to one p.m.
Twelve forty-six Twelve forty-six p.m.
Fourteen minutes to one Fourteen minutes to one p.m.
Twelve forty-seven Twelve forty-seven p.m.
Thirteen minutes to one Thirteen minutes to one p.m.
Twelve forty-eight Twelve forty-eight p.m.
Twelve minutes to one Twelve minutes to one p.m.
Twelve forty-nine Twelve forty-nine p.m.
Eleven minutes to one Eleven minutes to one p.m.
Twelve fifty Twelve fifty p.m. Ten minutes to one Ten minutes to one p.m.
Twelve fifty-one Twelve fifty-one p.m.
Nine minutes to one Nine minutes to one p.m.
Twelve fifty-two Twelve fifty-two p.m. Eight minutes to one Eight minutes to one p.m.
Twelve fifty-three Twelve fifty-three p.m. Seven minutes to one Seven minutes to one p.m.
Twelve fifty-four Twelve fifty-four p.m.
Six minutes to one Six minutes to one p.m.
Twelve fifty-five Twelve fifty-five p.m.
Five minutes to one Five minutes to one p.m.
Twelve fifty-six Twelve fifty-six p.m.
Four minutes to one Four minutes to one p.m.
Twelve fifty-seven Twelve fifty-seven p.m.
Three minutes to one Three minutes to one p.m.
Twelve fifty-eight Twelve fifty-eight p.m.
Two minutes to one Two minutes to one p.m.
Twelve fifty-nine Twelve fifty-nine p.m.
One minute to one One minute to one p.m.
E encerramos aqui a nossa lição onde aprendemos a escrever todo o período do MEIO DIA em inglês. Simples, não acha? Mas mesmo assim, repasse essa tabela mais vezes para que você grave definitivamente cada uma das formas de se escrever as horas em inglês. E não deixe de usar o auxílio da ferramenta Anki no seu aprendizado, pois vai te ajudar muito.